Tenants are responsible for the health and welfare of their pets. Landlords will report the tenant to an animal welfare organization if they believe a pet kept in their rental properties has been neglected or abandoned. Tenants must not leave their pets in the rental unit when they are away, unless clear arrangements have been made for their care. Pets must be vaccinated and regularly treated for fleas and worms (if appropriate). Tenants may have to provide evidence of this from their veterinarians. 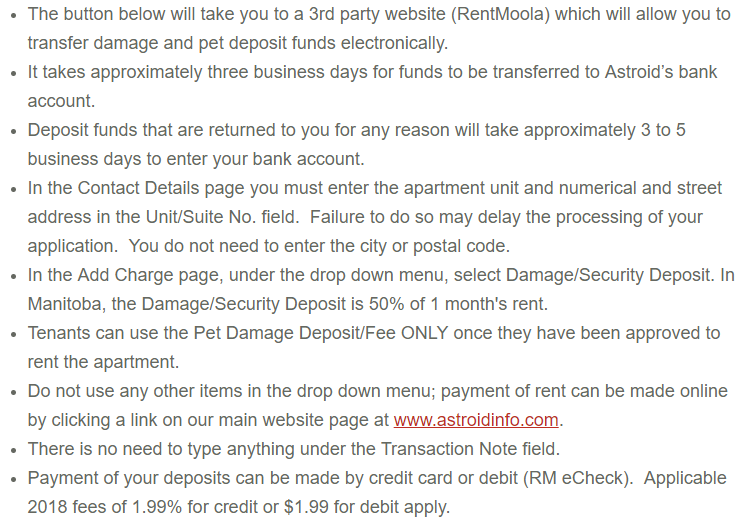 Tenants with pets must pay a pet damage deposit of one month’s rent. This covers the cost of repairing any damage caused by a pet, or any extra cleaning necessary because of a pet. Tenants must make sure their pets don’t cause trouble or disturb other tenants. This includes excessive noise or damage to other people’s property. Tenants must not leave animal waste inside their properties, unless the animal is a caged pet or trained to use a litter box. Litter boxes must be cleaned regularly. Any pet waste must be removed immediately from the common areas of the complex and disposed of safely and hygienically in the exterior garbage bin. Tenants are responsible for keeping the rental unit and the residential complex clean and free from parasites (ex: fleas). Tenants must not keep pets they intend to breed or sell. Tenants who want another pet after moving in must ask for their landlord’s written permission. Tenants with pets agree to have the carpets professionally cleaned before they move out, or pay the cost of carpet cleaning at whatever rates apply at that time. By signing, I/We hereby acknowledge the terms outlined above and are in agreement and bound for the duration of my/our tenancy.